A very short time ago in an office not too far from here, Walt Disney Imagineering published the latest concept art from their massive 14-acre Star Wars expansion to Disneyland Park. Unlike the first piece of concept art that was released at D23, this new glimpse gives a much better idea of how Star Wars Land will sit in relation to the rest of the park. There are also a lot of details that are driving Star Wars fans like yours-truly crazy with anticipation. And, yes, Star Wars Land is still a temporary name, and I refuse to use the rumored “Star Wars Experience” moniker until Disney makes it 100% official. Whatever it’s called, the Star Wars expansion is coming to Disneyland and Hollywood Studios later this decade. 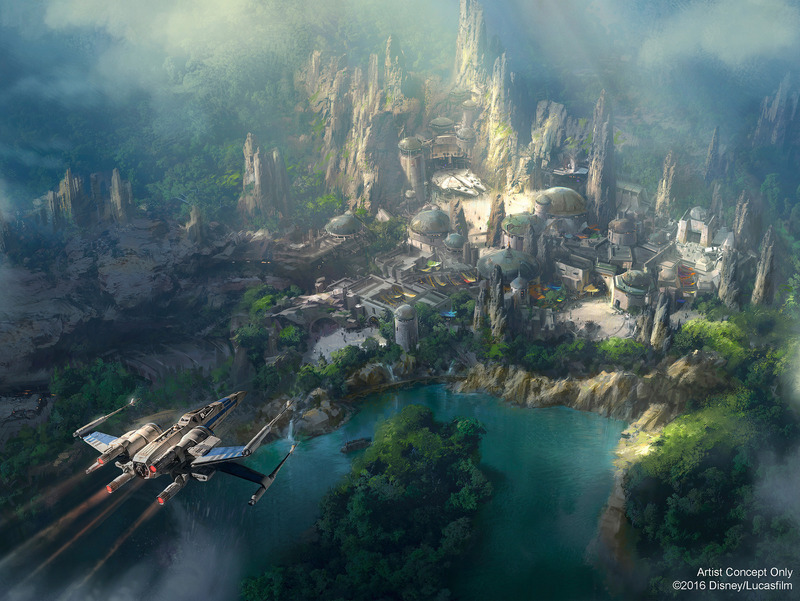 Check out the concept art for Disneyland’s Star Wars Land below, and click for full resolution. First of all, the big revelation is that the concept art includes a X-Wing-eye view of the expansion, including the rerouted Rivers of America. If you zoom in, you’ll notice the gorgeous bridge Disney previewed in a piece of concept art about the new rivers/train track earlier this year in the center. Other big details to note: the Millennium Falcon ride is most likely located in the upper center, where the full-sized Millennium Falcon is sitting. As with Disney California Adventure’s Cars Land expansion, it looks like Disney will be pulling off some massive rock work in order to hide a sizable ride building. Star Wars Land’s other massive ride featuring an escape from the First Order is most likely located on the left-hand side of the concept art. Star Wars Land will also feature shops and restaurants, including a cantina and a dinner club. My best guess for the retail and dining is that it mainly occupies the right-hand side of the concept art, which appears to be an otherworldly bazaar a la Mos Eisley. Not to mix my franchises here, but what’s up with this timey-wimey stuff? I understand that this is a challenge, since so many Star Wars fans hold the Original Trilogy dear. If Disney made a Star Wars Land without the icons they resonate with, they might risk disappointing those fans. However, Episode VII is the top grossing movie in the US, and Disney is making a huge investment in the Sequel Trilogy, so it makes sense that they would want to include First Order and Resistance elements as well. Since The Force Awakens was so clearly reverent and inspired by the Original Trilogy, those styles actually fit together visually. But the timeline doesn’t fit yet. Is it a big deal if Disney fudges the timeline a bit? Possibly not, as Star Tours can span decades of events in a single ride-through and I still adore that attraction. But the expectations for an entire themed land are higher, especially when Disney is touting this as the most immersive experience ever. The story matters because Disney has relied on emphasizing it to sell this expansion. Ultimately, it could be a minor annoyance that most won’t notice. But it’s definitely something that I’m very interested to see how Walt Disney Imagineering handles.